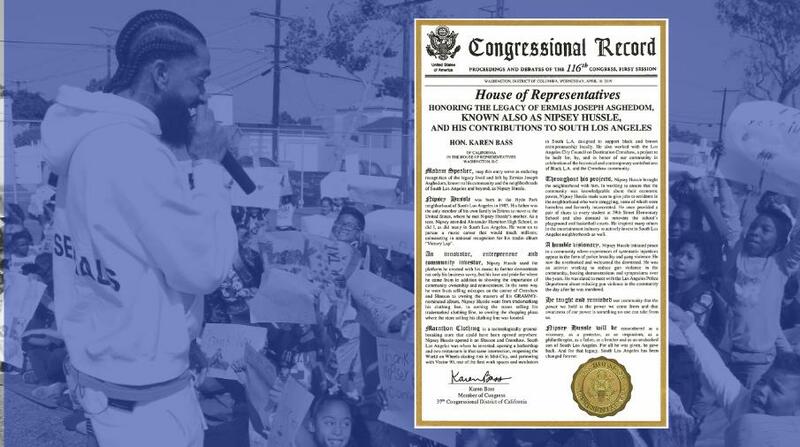 Los Angeles-area Representative Karen Bass honored Nipsey Hussle on the House floor, April 10. During her floor time, she enter into the congressional record the rapper’s contributions to the South Los Angeles community that raised him. Democrat representative Karen Bass had plenty words to speak regarding Ermias “Nipsey Hussle” Asghedom. Her district reportedly encompasses several neighborhoods southwest of downtown L.A. This includes Hyde Park area where Nipsey was born, raised, and regretfully murdered. Like a boss, Bass celebrated Nipsey’s accomplishments on the House floor. She described him as a “humble visionary” who “saw the overlooked and welcomed the dismissed,” as reports KTLA-5. On government record, Rep. Karen Bass recounted how Nipsey Hussle educated his community about their economic power. If you didn’t know, Hussle owned his master recordings. Reportedly, he used this money to reinvest in music and his community.